UPDATE: Comet is placed in administration, stock clearance starts today | What Hi-Fi? Comet is holding a clearance sale starting today as administrators continue to try and find a buyer for the struggling electrical retail chain. Offers are only available in store while stocks last, with our Forum users reporting discounts of around 10-20%. A spokesman for administrator Deloitte told Yahoo Finance: "The discounts are gentle. It's not a hard sale." Check out your local store for details. 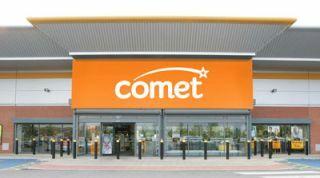 Accountancy firm Deloitte was officially appointed administrator to Comet last night and is urgently trying to find a buyer for the chain, which has 236 UK stores. Comet's website and stores were closed yesterday as the retailer checked its remaining stock, briefed staff and prepared for a fire sale of stock in an attempt to raise cash. A statement on the company's website says "Comet sale starting soon". Deloitte "temporarily suspended" Comet gift cards and vouchers last night while it assesses the situation. Although 6,600 jobs could be at risk, Deloitte says it intends to keep stores trading during the administration and isn't planning redundancies. Electrical retailer Comet has confirmed it will be placed in administration, with the possible loss of up to 200 jobs at its Hull HQ. The firm's website is currently offline. Staff were informed of the plan at a meeting earlier today. Comet says it is "urgently working" on plans to secure the company's future and it is hoped a buyer for the chain will be found. With losses estimated at around £35m for the year to April 30th, Comet has struggled in a tough market against supermarkets and online retailers such as Amazon. French company Kesa paid Comet's current owner OpCapita £50m to take the loss-making chain off its hands last year. OpCapita paid a token £2 for the chain. Today's Guardian reports that Comet faced a cash crunch after trade insurers cut credit lines to suppliers, forcing them to ask for payment for goods upfront. Comet has 236 UK stores, which employ around 6500 people. They are expected to remain open for business until the crisis is resolved. It's another sign of just how cut-throat the market for electrical goods has become during the recession. Last year Best Buy crashed out of the UK market after failing to stem mounting losses, and despite a high-profile launch.